What started in parts of Asia has quickly caught on and now cat cafes are popping up all over the world. How could a cafe cafe not be a success? Cats and cafes together at the very same time? We think it's a fantastic concept, as it's a nice way for people who cannot have a pet of their own to connect with some furry friends. Likewise, it's also great for the cats who are mostly adopted from shelters and are transported to a lovely life in a warm cafe with constant attention. Melbourne is the next lucky city to have a cat cafe introduced to it's surrounds and we couldn't be more excited. Anita and Myles Loughran are in the process of setting up the first Australian cat cafe and we were very lucky to speak with Anita about their preparations. 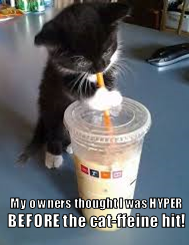 She even kindly helped us make some cat cafe themed memes! 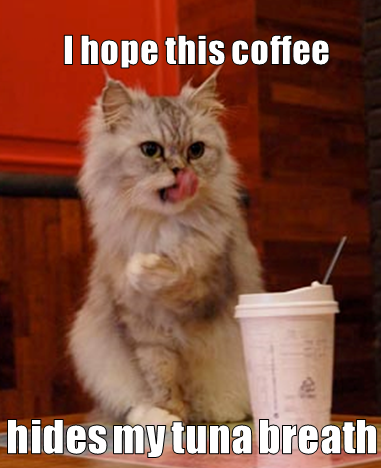 Tell us how you came up with the idea of opening a cat cafe? Several months after coming back from our honeymoon overseas, where we had visited a cat cafe in Japan, we had settled into our jobs, working towards putting a deposit on a small apartment of our own. It didn't take long before we became bored with our daily routine at work, felt under-appreciated, and unchallenged. In jest Myles suggested we open a cat cafe so we could have a job we actually enjoyed. I couldn't stop thinking about it and the next day began researching small businesses and contacting the Melbourne City Council to see if it would be legal. Once we had been given permission by the council we decided to put our savings towards our dream business rather than an apartment. You quit your jobs to start this. That's a brave move - was it a tough decision? I quit my full-time job because I was receiving calls and important emails I could't get back to for several hours. Before taking the leap I did try asking to work longer hours to have one day off each week, but as large corporations tend to be, they weren't interested in negotiations with employees. It was a very tough and scary decision but I don't regret the choice. It takes so much work and time to set up a small business from scratch, but it is also very rewarding. Myles is still working a casual job in hospitality. Anita helped us put together this fishy-breathed meme. Our first challenge was convincing the Melbourne City Council that we weren't joking! It took three months to receive permission from the council that a cat cafe would be legal as long as we complied with several regulations. Finding premises has also been a challenge. We found several suitable properties, however finding a landlord that would accept cats living in the premises became the real problem. Cat Cafes are really taking off and grabbing headlines and attention - how do you think that will impact the sucess of your venture? We are hoping it will be to our benefit! It is amazing seeing other cat cafes open around the world, especially ones that rescue cats from shelters and/or adopt. One impact that we hope it has on our venture here in Australia is making the concept more popular. Unless you have been to a cat cafe yourself or know someone who has, it can take a few minutes every time to explain the concept to someone. Hopefully the cats at Anita and Myles' cafe won't be as demanding! How do you choose the animals? Are there particular characteristics/qualities that make a cat 'cafe friendly'? We will be working closely with the Lost Dogs Home at North Melbourne and GAWS at Geelong. These two rescue shelters have amazing facilities and have agreed to help us find several cats with the perfect personalities for the cat cafe. The cats and kittens will be chosen depending on their characteristics and backgrounds. They will need to have always been indoor cats and they will need to get along with other cats, people, children, and like physical affection. Young cats will get used to their new environment quickly and we hope to find some older cats that just want to be lap cats. Any updates and news that you can share? The location will be within the Melbourne CBD area. We are currently negotiating terms for a premise, which is taking much longer than we were hoping it would. Hopefully we will have some news shortly. When we began negotiations we were hoping to be open to the general public by July and we will do our best to open as close to July as possible. Follow all the latest developements by checking out their Facebook page. You are doing an awesome thing and I wish you much success...May God bless you always! I hope their venture is a yowling success!!! !